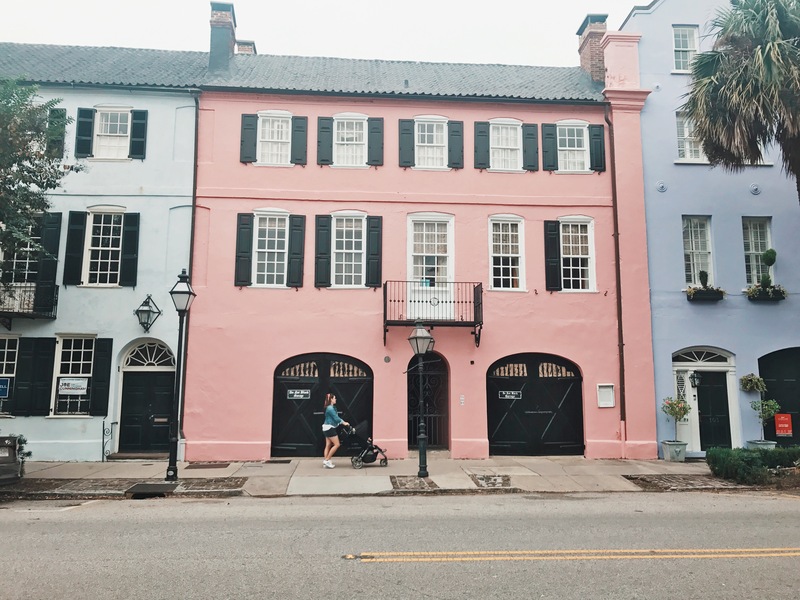 Is there anything better than a walkable city with great food, gorgeous old architecture and Southern charm? As a couple who fell in love in Boston, Charleston sounded right up our alley. Charleston’s food, gorgeous city architecture and seaside did not disappoint. My parents flew in to visit us so we rented an AirBNB on St. John’s Island which is right outside of Charleston. The property was 5 acres and we were able to park our trailer on the property. It was luxurious having full amenities for the week while we shared the home with my parents. We had one full day before my parents arrived so we decided to do a walking tour of the city. We parked along the Cooper River near Waterfront Park and walked down to the famous Pineapple Fountain. From there, we popped into Hazel Parker Playground to give Evelyn a break from her stroller. It was a wonderful first day to get our bearings. After that, we walked through Rainbow Row, a string of brightly colored homes (think Full House, San Fran. ), and headed to lunch at Husk Restaurant. Husk is a pricey, white tablecloth type of place. It usually wouldn’t be a place we’d pick to go with a toddler but every single person recommended it so we got a lunch reservation for right when they opened. They put us on the second floor veranda which was gorgeous, and gave E plenty to people watch from the street below and the ability to run around a bit and be loud without the table upon table environment in the inside space of the restaurant. I tried shrimp and grits for the first time and it did NOT disappoint. After lunch, we checked out the shops in the heart of Charleston, at Charleston City Market. There were so many gorgeous small shops and local vendors. And the food kiosks looked delicious. However, it was very crowded and difficult to navigate with a stroller. The next day, my parents arrived and first things first was getting a meal so we decided on Lewis BBQ for lunch. This was FANTASTIC. You order buffet style and they cut the large slabs of meat right in front of you. Food portions are dolled out family style on large metal trays covered with paper. We ate outside on the picnic tables. E played with rocks and some plastic cups we gave her and with the corn hole bean bags. On Sunday, we explored King Street. We grabbed brunch at The Macintosh. It is one of the top brunch recommends, known for the “Mac Attack” and Bone Marrow Pudding. It was good… but having lived in LA for 9 years it was the typical trendy overpriced place so we were meh about it. The highlight was stumbling upon on all the vendors along King Street. We got $1 fresh oysters and $2 oyster shooters from a pop up booth. We danced and clapped along with a live blues band made up of college age looking boys who were seriously talented. We spent the afternoon enjoying the beautiful seaside at Kiawah Beachwalker Park while Evelyn napped. It was overcast and cool but I love walking on the beach with rolled up jeans and a sweatshirt. The beach was pristine and stunning with white sand and tall beach grass. I think our favorite eating spot was on the last day. We went to Leon’s Oyster Shop before dropping my parents off at the airport. The restaurant is a converted auto shop and the decor inside is so cool. We ordered fried chicken and oysters. We tried breaded oysters for the first time and they were good – but I think I prefer fresh. The fried chicken was hands down the best I’ve ever had – and I’ve had good fried chicken in both LA and Nashville. They also have a great selection of beers and champagne and soft serve ice cream. this place is fantastic and I would visit Charleston again just to eat at this one restaurant! **Side note, there’s also a little enclosed outdoor patio where E was able to run around. So we all took turns being out on the patio with her so she could run around while the rest of us ate. Angel Oak Tree Park – This 400+ year old massive oak tree was super close to our AirBNB. We did do a drive by but it was down pouring so we never got a chance to get out. This is a good spot for a little one to run around. Patriots Point – A naval and maritime museum. Tickets for adults are expensive ($24PP) but kids under 6 are free. This looked really interesting and fun for all ages. It’s mostly outdoors and we didn’t have the best weather so we never made it here. Plantation Tour – Boone Hall, Middleton Place, Magnolia and Drayton Hall sounded like the top four with Magnolia seeming to be the most popular. If you travel to Charleston and try out any of the places on this list send me a pic! Happy traveling, mommas!